Earlier this year, Salisbury High School received a grant for almost $10,000 to develop the Salisbury High School Highmark Fitness Zone. 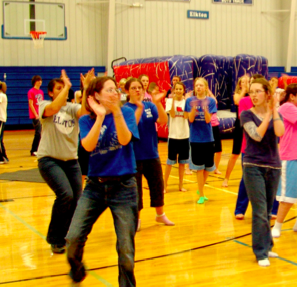 The purpose of creating a Fitness Zone was to provide students with the opportunity to learn how active-play video games support a healthy lifestyle. Students have been using the Wii Fit Plus system, Wii Sports Resort and AE Sports Active 2.0. Thanks to Miss Heather Morningstar, High School Principal, Mr. William Dovico, High School Assistant Principal and Mr. Adam Legath, Physical Education teacher for their innovative thinking in providing our students with unique opportunities to develop life-long fitness habits. Read more about the Highmark Healthy High 5 Grant in an article that appeared in the December 7, 2011 Salisbury Press. Thank you to Salisbury Press editor Debbie Galbraith for permission to post this article on the TL2014.org website.